Staffords, leader for the best part of a century in fine foods, remain a favourite with consumers, who demand quality they can trust. Now Staffords have added a classic dessert, and a sweet new baking aid to its range. Staffords classic Créme Brûlée dessert is a quick and easy mix. All that is required is to warm with cream and milk – et Voila! One sachet is enough to fill four large or six smaller ramekins. Once cooled, sprinkle with sugar and caramelise using a blowtorch or griller. The perfect French Dessert made quick and easy by Staffords! As for the Fruiti Pebbles, these gems have fruit-flavoured centres covered with chocolate candy coating. They can be used as an ice-cream topping, surprise ingredient in biscuit dough or muffin mixes, decoration for iced cupcakes, and anything else a creative mom can imagine. Naturally, kids love to nibble on them any time, any place, as a special treat. 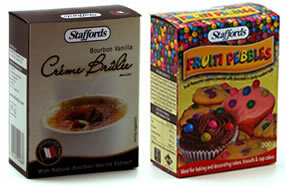 Staffords Créme Brûlée, RSP R29.90 and Fruiti Pebbles, RSP R33.49, are available nationwide.